Auto : 12-lead , optionally including rhythm strip. selectable speed: 25, 50 mm / s. Adjustable sensitivity: 0.5, 1, 2 cm / mV, can be combined with reduced sensitivity for precordial . ability to perform many Copies as desired. RHYTHM : Up to 12-lead so simultaneous Continue . New patient module with Immediate scanning signal for reduction and elimination final of the " noise " analog with scanning at a rate of 8000 samples / second and derivation. Allows simultaneous connection of the 10 conventional hoses for all 12 leads. Also, the equipment allows receiving work orders (optional included) from the Management System ECG's Trace Master Vue (not included) with automatic loading of the "worklist"
Display screen in real time and simultaneous 12-lead more a rhythm strip indicating the Location loose electrodes or < strong> inoperative . Equipped with Real PC keyboard and color screen Touch 6.5 "effective, high-resolution and allows the visualization prior to printing full ECG , including patient information. thus allows to decide if the quality is satisfactory or if needed reacquire ECG. - measures and interpretation justified performed automatically by the computer . 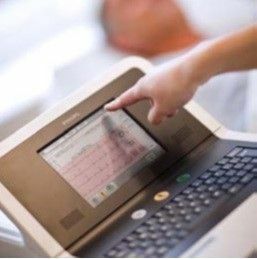 The electrocardiograph, on the other hand and automatically stores up to 5 continuous minutes of all connected leads being possible, a posteriori, retrieve ECG's complete any time pertaining to the above range. 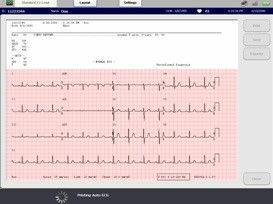 Also during the patient session, marking up to 6 successive events are allowed, all with full corresponding eg 12 simultaneous ECG leads that can be stored permanently. 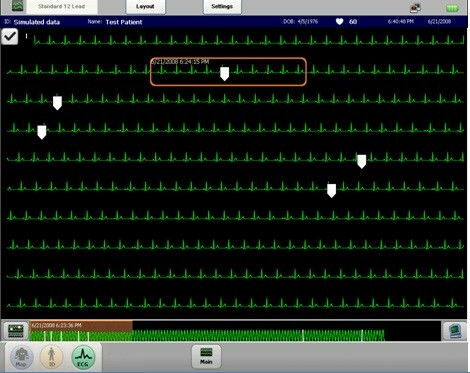 - Analyzes 10 seconds of ECG for each lead . - Digital filtering signal to reduce any noise components mixed with the signal from the patient . 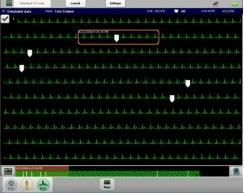 - Detection and advanced analysis of pacemaker . Justification Why each diagnostic statement indicated, which makes the most of the editing and validation it.